We went to Sri Lanka last week for four days for a friend’s wedding. Everyone received a gift from the bride and groom, then the DJ got going – and so did the most dance-addled wedding crowd I’d ever had the gleeful privilege to be a part of. We were taken around some of the sights on the island for a couple of days after the wedding, one of which was Danbulla Temple. We were all given a flower at the entrance to take up to the temple. Mine didn’t even make it halfway. Leaving, there was a brief, ostensibly routine, yet all-the-same extraordinary, pat-down at the airport that left me glazy and strangely elated. It seems this year’s cherry blossoms had held on a little longer than usual. 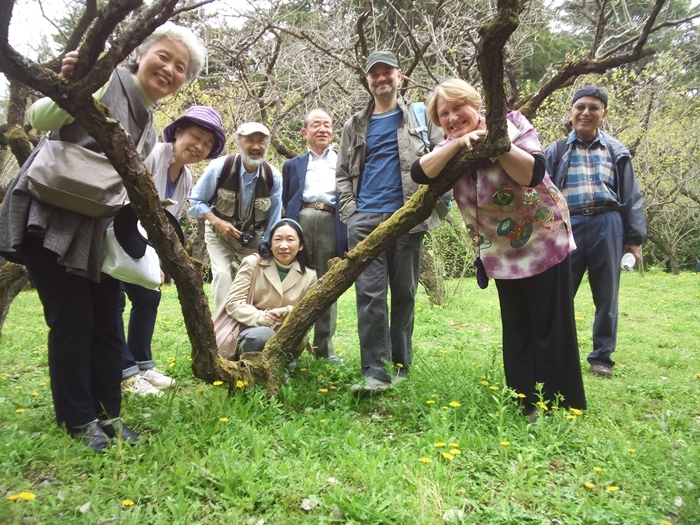 Perhaps they did so for the benefit of the ten Hailstone poets who attended the flower ginko event at Kyoto Botanical Gardens and Kamo River on April 10th. Anyway, we’d like to think so. 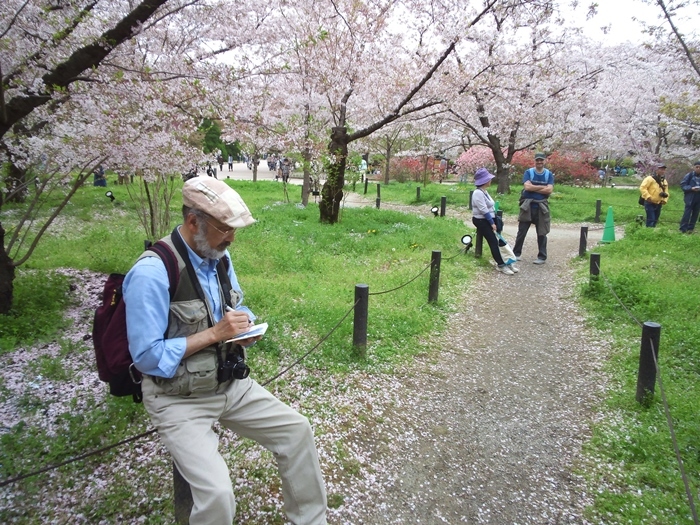 Loosely organized by Ursula and Branko, the late morning and early afternoon were spent at Kyoto Shokubutsuen, the oldest and the most comprehensive public botanical gardens in Japan. A bit surprising then that most poets in our group had never visited it! Since B. is the proud owner of an annual pass to the Gardens, he was a logical choice to guide the poets around, suggesting routes and beauty spots. We started off at the Tulip Garden near the North Gate. There, we encountered a newly-wed couple, their every step followed by a hired photographer. This sight is not uncommon at the Gardens. What was unusual, though, was that they were evidently not Japanese (probably Korean or Chinese), for their super-relaxed behaviour went hand-in-hand with non-conventional, brown attire! 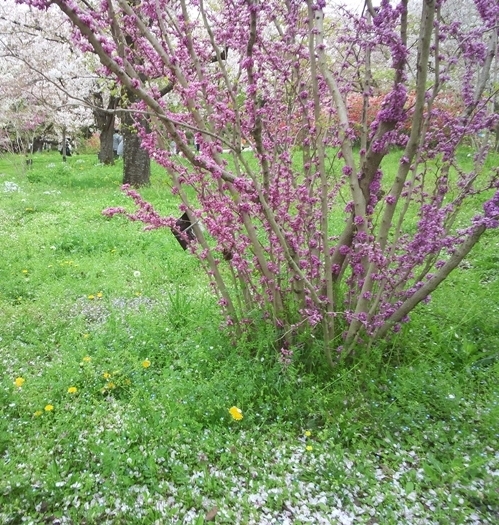 … and the Perennial Garden, where we all gathered by a lilac daphne (Daphne genkwa). Each of us took a sniff at its strikingly purple flowers, whose scent, Tito proposed, was that of an iced-sugar lump. After leaving the Shokubutsuen, we dropped into a nearby supermarket and, armed with bento-boxes, headed toward the Kamo River. There, we found a cosy spot on its east bank, where we ate, drank and discussed our haiku drafts. 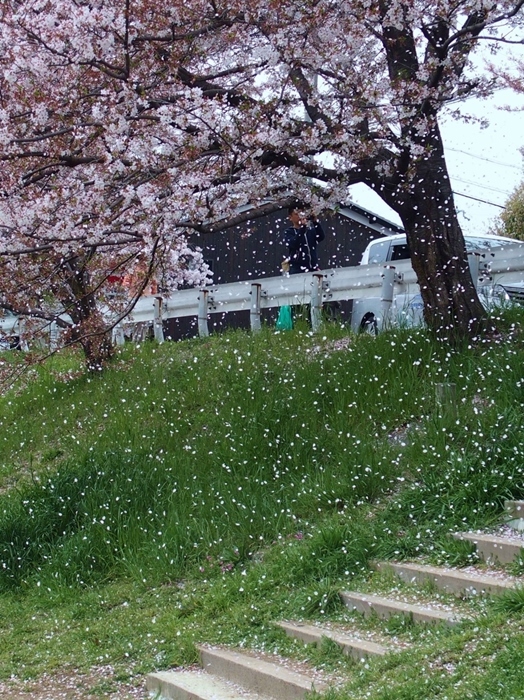 We were joined there by Richard D.
As we were preparing to leave, a sudden gust of wind brought about a hanafubuki, a pale-pink cherry blizzard.